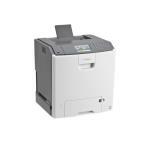 Lexmark C748DE Expert Reviews - Read Reviews and Buy Smarter Online. Verdict: The $1199 (as of July 30, 2012) Lexmark C748de is among the fastest color laser printer we've tested, and its output is second to none. Verdict: The Lexmark C748de ($1,199 direct) provides decent speed and voluminous standard and optional paper capacity as a color laser printer for a small office or workgroup. Its output quality, though a bit below par, was still good enough for internal business use. Verdict: The Lexmark C748de is consistent color printing experience with higher end features including the 4.3-inch touch screen, precise color matching and high capacity toner cartridge replacements at a more affordable price point.